A large majority of us ladies (and a few of you men) have struggled with cellulite! You know what I am talking about ladies...and if you're like me, you've probably tried every cream or lotion out there to try to get rid of it! And with little luck, most of these things we've tried have just been a waste of money. I'm going to give you all the secrets today that are tried & proven to greatly reduce the apperance of cellulite for good! So, first of all...what exactly is this lovely stuff we call cellulite? It is simply fat deposits under our skin. There are multiple causes, but some of the most common ones are as follows: lack of exercise, poor dietary habits, genetics, aging, fluid retention, hormones, being overweight, & decreases in collagen associated with aging. Most women do have some & it is completely normal. 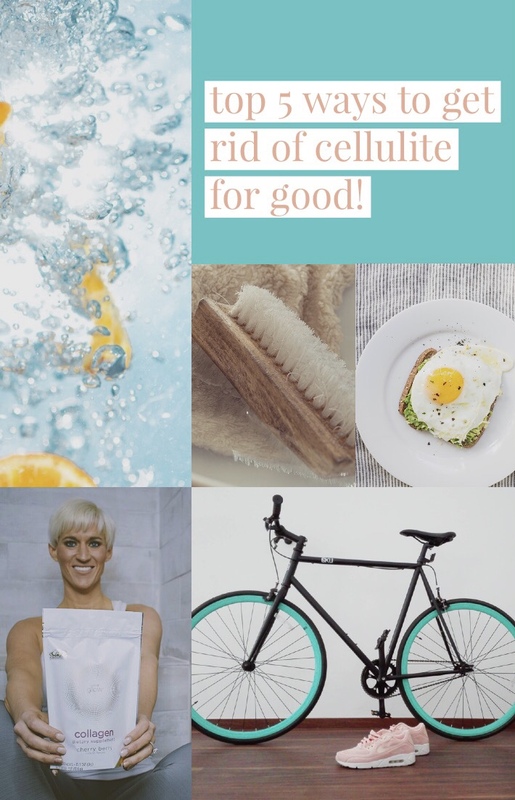 I am going to give you ALL of the ways I have personally seen work to seriously reduce the appearance of cellulite: proper nutrition, increasing collagen, exercise, increasing water intake, & dry brushing. Everyone knows a healthier diet will help reduce cellulite...but what specific changes work best? The #1 dietary change is reducing your sugar intake. Also, increasing foods rich in potassium & magnesium makes a huge difference. Foods high in type 2 collagen such as bone broth greatly increase skin elasticity & reduce cellulite. And finally, lean proteins such as chicken, eggs, fish will help you build lean fat burning muscle that will definitely help blast cellulite for good! Also, check out my "6 Week Shred" program for the nutrition strategies I have incorporated specifically for fat & cellulite burning! Physical activity is a no-brainer. Any type of exercise is going to get those fat burning mechanisms turned on! Specifically, burst training or HIIT (high intensity interval training). Also, weight training is amazing at increasing fat burning lean muscle! If you're a newbie, simply start by just walking! This alone will make you see a reduction in cellulite. The exercise strategies in "6 Week Shred" are amazing at reducing cellulite! I can't say enough about all of the benefits of water! I've done a blog post about this before if you also want to check that out here. Water helps rid our bodies of toxins that can lead to the experience of cellulite. It also reduces fluid retention & swelling. So, drink up today! It's simple & free! My hope in sharing this with you is that you'll try some of these today & make them a consistent habit! I would love to hear which ones you are going to try or have tried in the comments! Also, for even more amazing results...check out my “6 Week Shred” program ASAP! This detailed online nutrition/exercise plan is designed specifically with fat burning & cellulite reduction in mind!